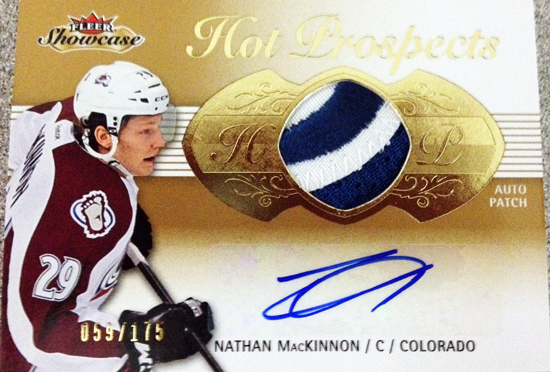 By now most collectors know it is a special year to collect NHL® cards with Upper Deck’s Double Rookie Class in full effect for 2013-14 hockey releases. 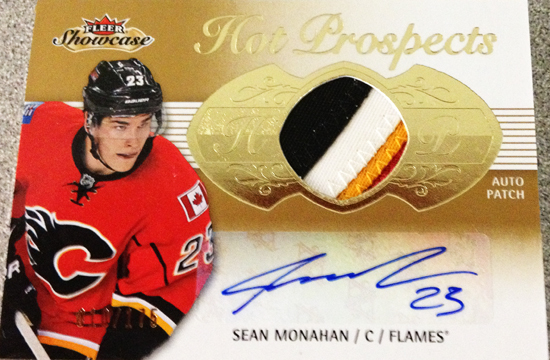 Savvy collectors also know that now is the time of year where more serious hockey products begin to make their way to the market and a product that has been getting more and more buzz is the 2013-14 NHL® Fleer Showcase release. Recently we shared some preview images which really got fans excited, but the key drive to the product is the rookie autograph patch cards. Falling at one per box on average with two levels of rarity, the rookie autograph patch cards will be high in demand with collectors and should provide a lot of fun chase with some many awesome patches used in the product. Take a look at some live images of rookie autograph patch cards in the product from the product pack out!